The World Almanac® and Book of Facts 2019 Kit features everything you need to enrich lessons across the curriculum and enhance the use of the best-selling World Almanac® book in your classroom. Get students excited about learning with The World Almanac® 2019 Trivia Game, an interactive Q&A card game with game show-style skills-based challenges. 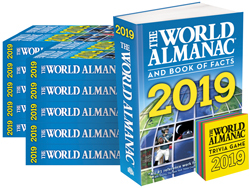 Also included in the Kit are one hardcover edition and 20 paperback copies of The World Almanac® and Book of Facts 2019, perfect for classroom use or circulating in the library. The World Almanac® and Book of Facts 2019 Kit engages all the core competencies students need to become independent researchers, can be used to teach skimming and scanning techniques, and makes hands-on learning fun. Free teacher resources, which include fact and activity worksheets and an answer key, are available for download from our website.